Ronan Patrick John Keating is an Irish recording artist, singer-songwriter, musician, and philanthropist. 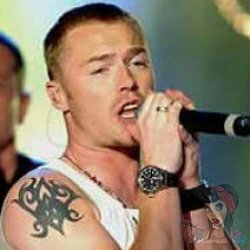 Keating debuted on the professional music scene alongside Keith Duffy, Mikey Graham, Shane Lynch and Stephen Gately, in 1994 as the lead singer of Irish group Boyzone. His solo career started in 1999, and resulted in 9 albums. Keating gained worldwide attention when his single "When You Say Nothing at All" was featured in the film Notting Hill and peaked at number one in several countries. As a solo artist, Keating has sold over 25 million records worldwide alongside the 30 million records with Boyzone, and in Australia he is best known as a judge on The X Factor.Keating has worked as a charity campaigner, most notably for the Marie Keating Foundation, a foundation that raises awareness for breast cancer. It is named after his mother, who died of the disease in 1998. Keating's net worth is £17 million. 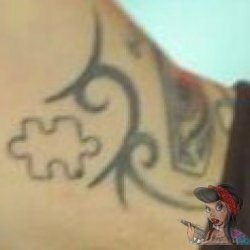 Ronan got his first tattoo at 18 - the Japanese sign for 'Warrior' on his right upper arm - but it is no longer visible today because he had it covered with a larger Maori tribal design in early 2003. Also on that arm is a Superman logo that Ronan had done in Oct 2009 in memory of Stephen Gately, who died that year; some writing in Hebrew which means "Sorry looks back, worry loJigsaw pieceoks around, faith looks up" (Oct 2010) and an anchor with a piece of winding road around it (Oct 2011). The latter stands for some of his past charity activities - a relay swim through the Irish Sea in 2011 and his two charity walks through Ireland in 2003 and 2005. Ronan's right upper arm. Image copyright: Splash NewsOn his right upper arm, Ronan started with the Chinese symbol for 'Love', which him and Yvonne had done not long after they got married in 1998 - he had this one covered up in 2013. Around this is a Celtic cross (June 2004) enclosed by a shield design that he got on the TV show 'London Ink' in summer 2008. This has been enhanced with some red cherry blossoms and a couple of flowers at the top of his arm (March 2011). F*ck the Begrudgers...partly hidden by his watch.On the inside of his left upper arm, Ronan has a large Japanese lotus flower tattoo (June 2010), and next to it is a bonsai pine tree (Nov 2010). The lotus flower often stands for the struggle of life, or the process of growing from unfavourable situations and rising above them - which makes sense considering Ronan went through a difficult time in 2010. The bonsai tree can apparently symbolize many different things so we can only guess what it means to Ronan. Finally, on the inside of his left wrist he's got the writing 'F*ck the Begrudgers', which he had done in Sept/Oct 2010. This may have been his way of dealing with the negativity he got that year especially in Ireland and the UK. Image copyright: Bondi InkOn the back of his neck, Ronan had a star done in summer 2009 (visible in the 'Stay' video but it has since been reworked and is now all black). There is another design around the star now which looks like another cross, but we are yet to see it in full. This one was done in 2010. In early 2010, Ronan had the words "The Future is Unwritten" tattooed on his back, which he says is a quote by The Clash/The Pogues singer Joe Strummer. Above this writing, on the back of his shoulders, Ronan had a pair of wings done in October 2011. In 2012, Ronan added the statement 'Always have courage' in Italian on the side of his body. This is a quote by Pope John Paul II which Ronan found inspiring.